Over time, teeth can become discolored due to tobacco use, long-term antibiotic use, and beverage stains. Discolored teeth can quickly make a smile lose its youthful quality. Fortunately, modern teeth-whitening technology can dramatically improve the appearance of your smile by whitening and brightening your teeth. 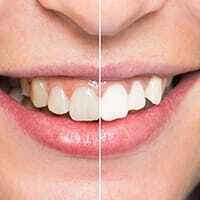 We offer ZOOM!® teeth-whitening technology. ZOOM!® is available for both an in-office whitening treatment and take-home use. Our doctors have been treating satisfied patients with this revolutionary tooth whitening system for years and achieving amazing results. Teeth-whitening performed by one of our certified dental assistants is the most effective way to whiten the teeth by far. ZOOM!® chair-side teeth-whitening technology involves applying a pH-balanced hydrogen peroxide bleaching gel to your teeth. Your gums, lips, and cheeks will be fully protected to avoid exposure to these sensitive tissues. The gel will then be activated by a laser light directed at the teeth to brighten your smile by many shades. The entire process takes just two hours. We also offer customized take-home teeth-whitening trays as a cost-effective and convenient alternative to our in-office whitening system. Take-home teeth whitening trays are also helpful when you need to touch-up in-office whitening results periodically. Patients typically use the trays for approximately thirty minutes twice a day until their desired shade is achieved. Our take-home method allows patients the freedom to easily fit whitening into their schedule, no matter how busy.